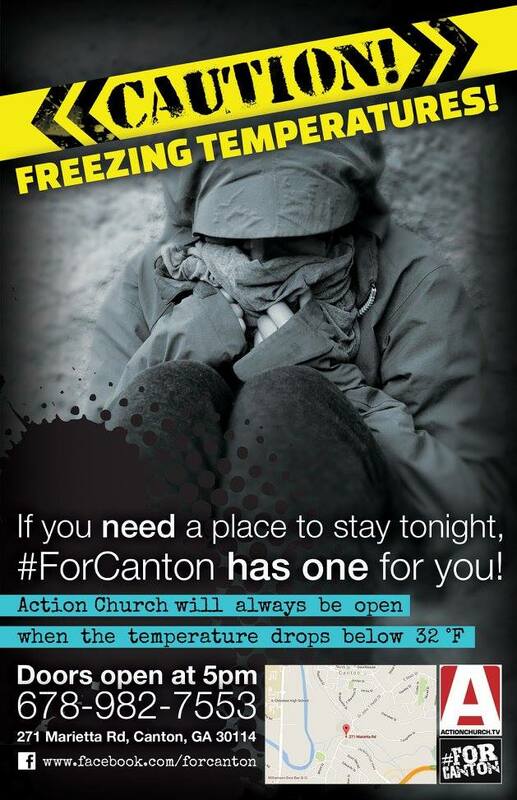 #ForCanton has the privilege of operating the only warming shelter in Cherokee County. 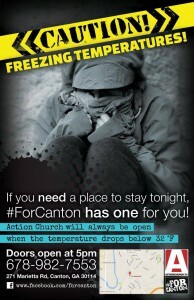 When the local temperatures drop below freezing the #ForCanton Warming Shelter opens it’s doors at Action Church. Located at 271 Marietta Rd. our shelter is open to provide a warm place to stay, no questions asked.. Our doors open at 5 p.m on nights when the temperatures are forecasted to be below 32 degrees.. We provide a hot meal, warm bed, place to shower, and breakfast. If you or anyone you know is homeless, displaced, living in a place with no heat or just needs a safe place to stay on nights when temperatures drop below freezing, the doors are always open. For more information call 770-345-3030.